Hi everyone! A big thank you to all who played along with our Lunchbox Love challenge. We had a fabulous time checking out all your adorable creations. Each card was cuter than the one before! 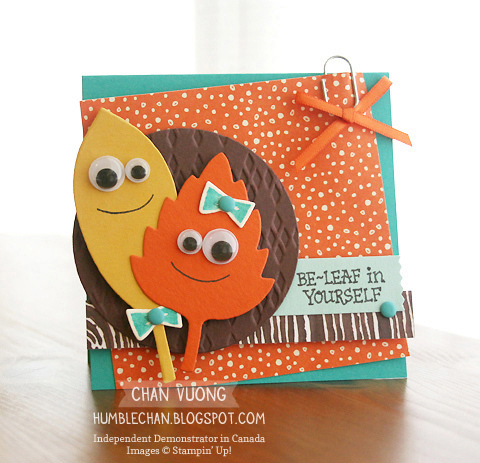 Chan's little card is unbe-leaf-ably adorable! How clever she was to make faces out of the leaves, and the mis-matched eyes are so cute. The balance of colors, pattern and texture is just perfect, as are the little embellishments. Congrats, Chan! You are my Headliner this week! Winners, be sure to collect your badges here. Don't forget to come back tomorrow for a pretty color challenge from our Joanne! Thanks, Amy! I'm honored to be your pick! And I love Chan's card!! It's amazing! Thanks so much for choosing my card as a cut above for this week, Nance! And congrats to all the other winners. Chan, your card is amazingly adorable!! Love the Headliner and thanks for the shout out, Jodi! Thank you Joanne for selecting my card as your pick...it's an honor to have been selected with so many fantastic cards in the link this last week! I absolutely adore Chan's card...those googly eyes are the icing on the cake!